When Roy Greengrass walked into the new District 1 Community Center on Monday, May 21, he thought he was there to see his sisters. At least that’s what his children told him. To his astonishment, the gymnasium was full of people, ready to witness the presentation of his Purple Heart medal and to join in the celebration of his birthday. Greengrass served in the U.S. Marine Corps as a lance corporal during the Vietnam War and was wounded in action. "I served one year, six months and 10 days. I used to be a ‘tunnel rat,’" Greengrass said. "Then I got wounded and they sent me home." He received a Purple Heart medal but then gave it to his mother. Several decades later, he remembered his medal, but it was nowhere to be found. "After she passed away the purple heart must have left with all of her belongings," Greengrass said. Greengrass remembers being sent to the Great Lakes Naval Hospital. After he healed from his injury he went to work. "I started walking and then I went to work on bridges," Greengrass said. 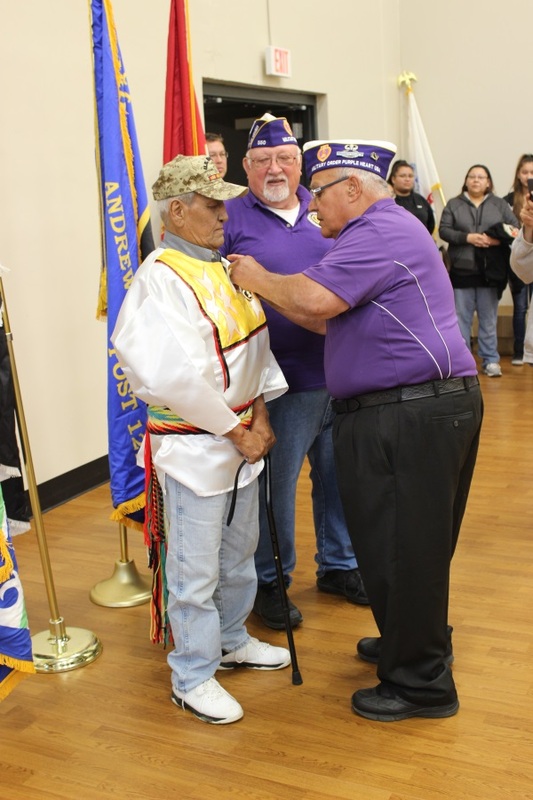 About two months ago, Greengrass asked Ho-Chunk Nation Veterans Service Office Margaret “Muggs” Garvin if he could get a replacement Purple Heart medal, having lost it many years ago. Garvin filled out the necessary paperwork and had Greengrass sign the form. "I hold him in such high regard," Garvin said. "When he sees me he is always so happy and he always gives me hugs. I think very, very much of him." On the form, Garvin put her office address as the place it should be delivered. When it arrived, as a special favor to Greengrass, Garvin sought out someone to engrave his name on the back. “None of the trophy sellers would do it, so when I found a guy in Tomah, I headed right over, Garvin said. Although he was nervous about doing the job, the man was successful in the engraving procedure. Garvin contacted the family to see how they would like to present the medal to Greengrass. Murton, his son, said his father’s birthday was on May 21, so it would be a great day to present the Purple Heart medal to him on that day. So the stage was set. His children gathered with him to take him out for his 69th birthday. They drove by the new District 1 Community Center and encouraged him to come inside, telling him one of his sisters was inside and she wanted to see him. Upon entering the building, he soon found out the surprise – a birthday celebration along with a special presentation of his Purple Heart medal. Greengrass’ son, Murton, said it was great to see the community gather to honor his father. "It meant a lot. He's my dad and he means a lot to me," Murton said. Cameras snapping photos, Greengrass stood at attention while the Purple Heart medal was pinned on his chest. An honor song was sung while Greengrass and those in attendance danced around the drum group. A meal was served afterward. Greengrass will remember the day, knowing he had received recognition for the service he gave to his country and the people he loves. "It really was a great honor to do this for him," Garvin said.